Cordyline fruticosa, also called Hawaiian ti, is an evergreen shrub that performs well grown outside in warm and humid, frost-free climates. It is hardy and requires little care growing throughout U.S. Department of Agriculture plant hardiness zones 10 through 12. It works well planted in containers and grown indoors or outside on patios. 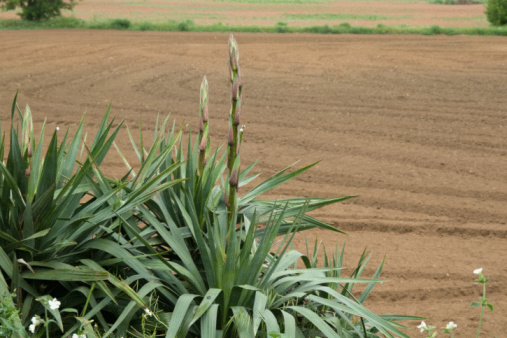 The plant is palmlike, growing up to 10 feet in height. Depending on the cultivar, the glossy foliage is purplish-red, green or streaked with combinations of purples, reds, white or yellow. In springtime, mature plants produce small yellow or reddish blooms. 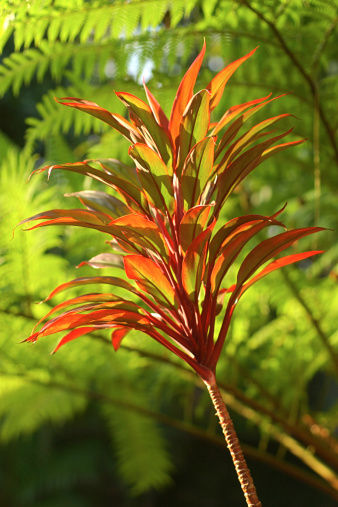 Cordyline fruticosa has colorful foliage. 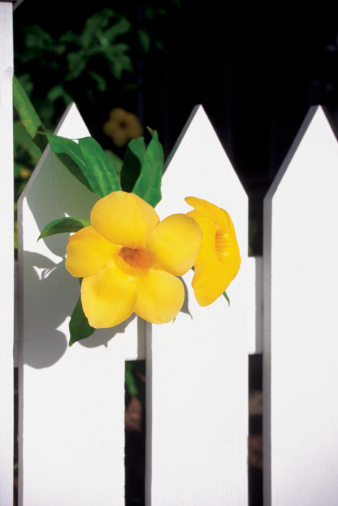 Remove unwanted vegetation such as weeds or grass from a planting site located in partial sun to partial shade. Select a location with well-drained soil. 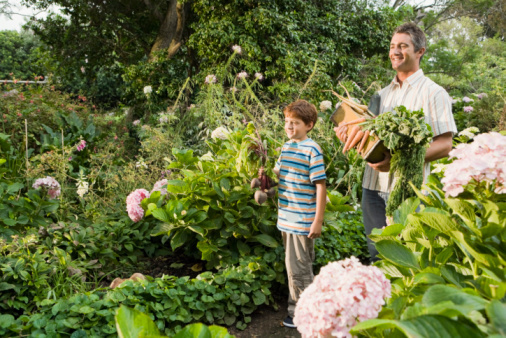 Remove the vegetation by hand-pulling and raking, or treating the area with herbicide. Inspect the Cordyline fruticosa root ball for wrapping before planting, as wrapping roots slows root development. Pull any wrapping roots gently apart with your hands. Plant the Cordyline fruticosa at the same depth it was growing inside its pot. Dig a hole as deep as the container and one time wider. Place the plant into the hole and backfill with soil. Water Cordyline fruticosa after planting, saturating its root system. Water the planting site regularly to keep the soil moist, especially during warm, dry seasons. Prune to remove dead foliage or to propagate new plants from stem cuttings. Snip off dead leaves using pruning shears, as the plant's lower foliage dies as the plant ages. Treat any pest problems such as spider mites, scale or aphids. Use an insecticidal product safe for use on Cordyline fruticosa and apply according to the product's instructions. Grow the Cordyline fruticosa in a draining container that is one time larger than its root ball. Fill the container with a well-drained potting mix amended with a slow-release fertilizer. Follow package instructions concerning fertilizer amounts. 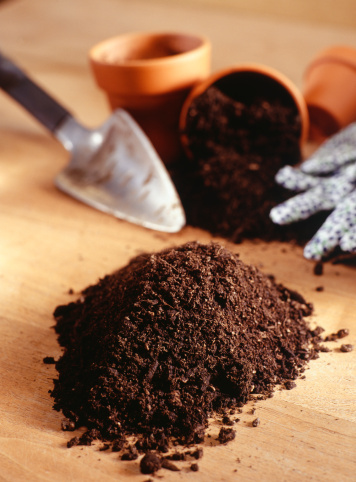 Water the container regularly to keep the soil moist but not soggy. Water until it runs from the container's bottom drain holes. Fill a plastic spray bottle with water and mist indoor-grown Cordyline fruticosa plants weekly to create humidity. Situate outdoor containers in an area that receives partial sun to partial shade. Situate indoor containers in an area that receives bright, indirect light. Treat any pest problems such as spider mites, scale or aphids. Use a product safe for use on Cordyline fruticosa and apply according to the product's instructions. Snip off dead foliage. Use pruning shears and trim away any dead leaves.